On a rather damp Sunday afternoon, Bob and I seized a reprieve from the rain for a hike along the Seaton Hiking Trail north of Whitevale, in Ontario. 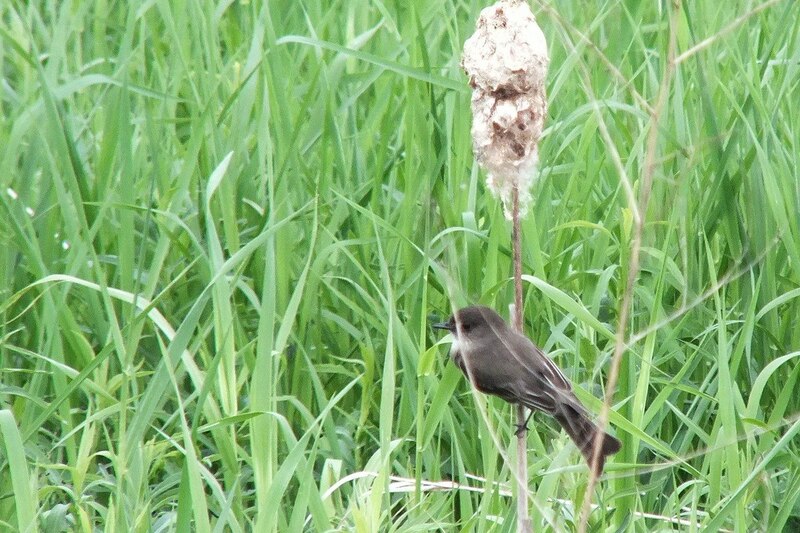 From the lookout at the dam, we observed numerous Barn Swallows darting about the surface of the water, but also watched as a pair of Eastern Phoebes (Sayornis phoebe) made repeated forays into the bulrushes where the water was calm. 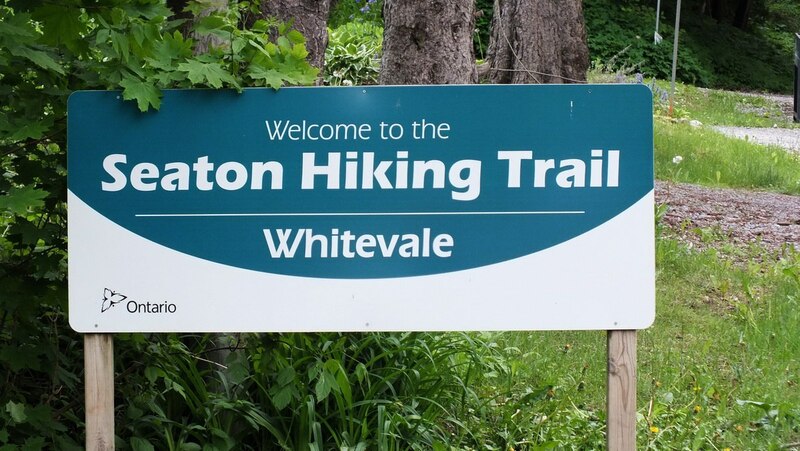 Seaton Hiking Trail offers two options for exploration from the pretty little community of Whitevale. 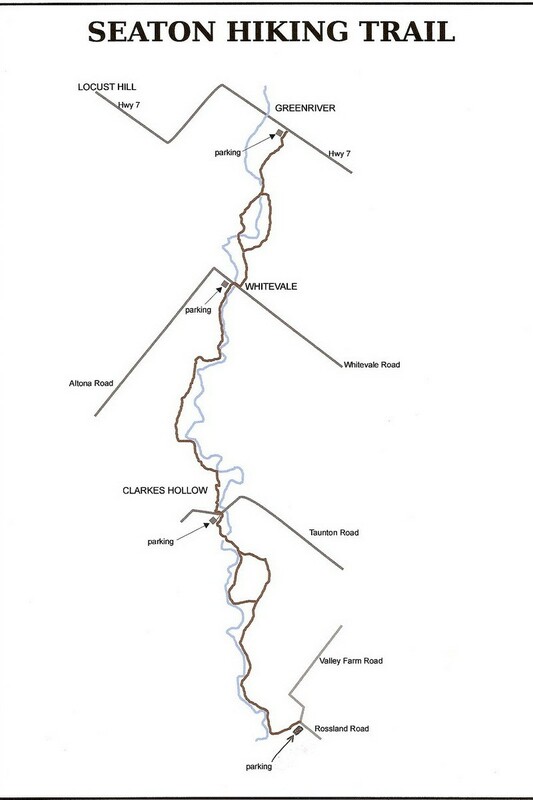 Hikers can head south towards Rossland Road or north toward Highway 7. 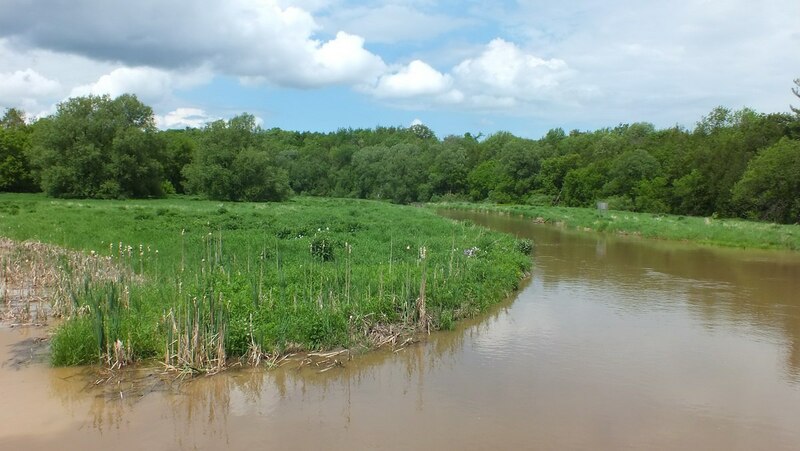 In either direction, the trail follows the river and offers ample opportunities for wildlife sightings. 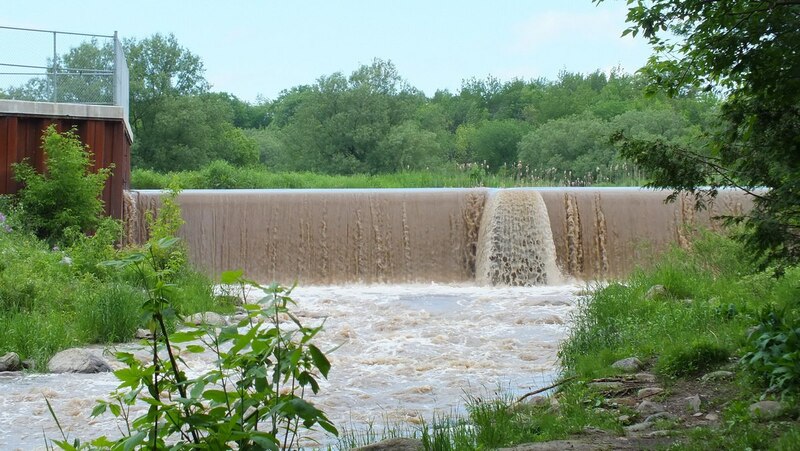 About 2/3 of the way between Whitevale and Highway 7, there is a man-made dam that was constructed to control the flow of water. Because of the previous day’s rain, the waters were running red with stirred up sediment and thundered over the dam with abandon. 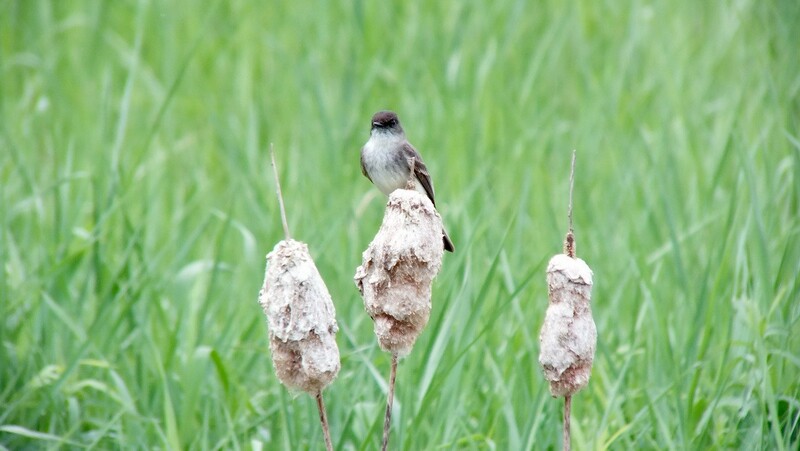 The Eastern Phoebes, time and again, flew in and landed, either on the stalk of a bulrush or on the dense dried spike at the top of a stalk. Gathering storm clouds once again threatened to block the sun at about the time Bob and I reached the dam, but still we dallied there, enjoying our view of the calmer waters above the dam and the sounds of surging water when it plummeted over the barrier. When Bob and I first caught sight of the black and white birds, our first thought was of Eastern Kingbirds, but these birds were too small. A distinct difference in the colouring of the two birds led us to believe that one was a male and the other a female. 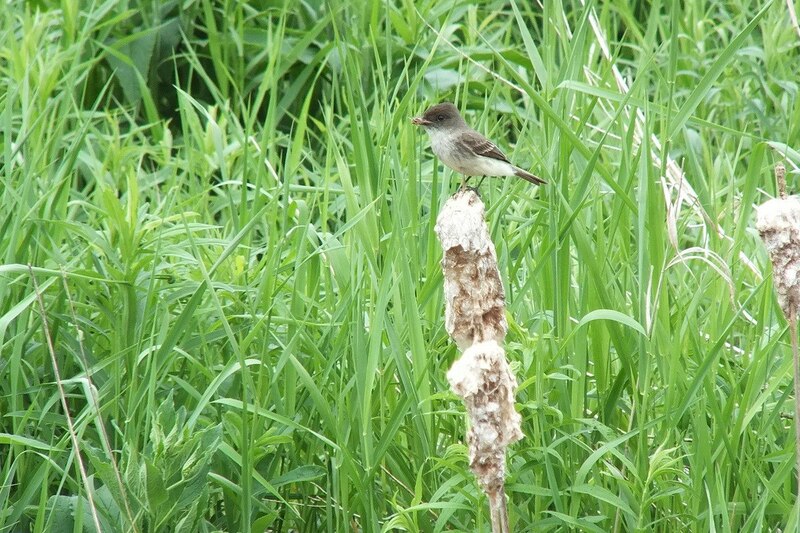 With each passing visit to a bulrush spike, the birds departed with a mouthful of cottony fluff. Eastern Phoebes make their nests of mud, moss, and grasses, and will line them with soft material such as fine grass, hair or plant fibres. The two birds remained within sight of one another, and made stops in a small tree at the bottom, and just to the side, of the dam. We thought perhaps they were building a nest but could see no evidence of one. 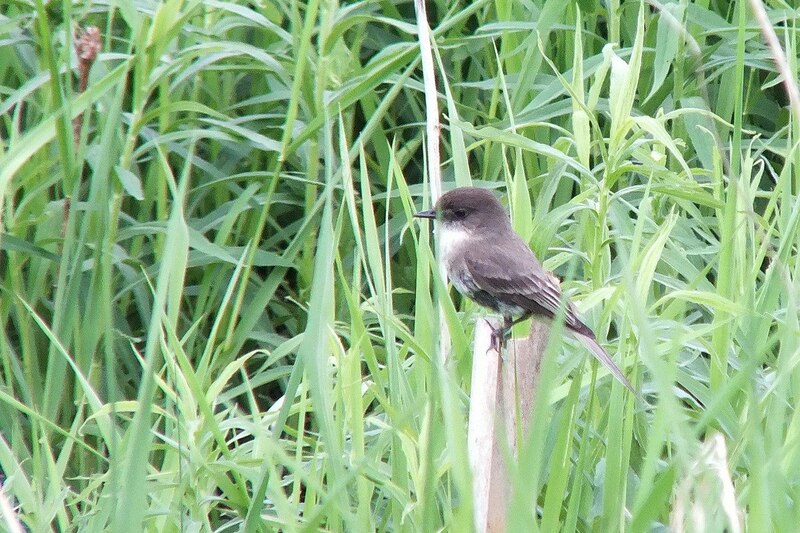 An Eastern Phoebe is a plump songbird with a head that seems too large for its body. The plumage on the head is darker than that of the back, but both are a blackish-brown in colour. 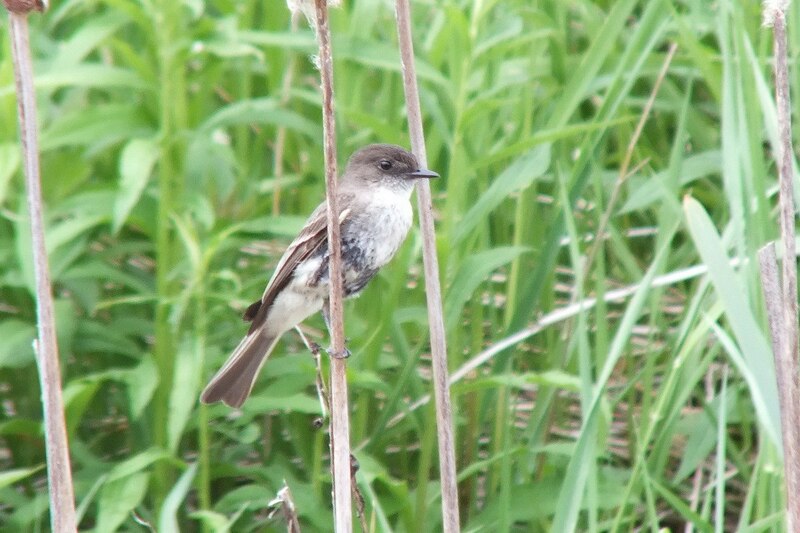 Eastern Phoebes are flycatchers, and in nesting season, can be found in the vicinity of streams and lakes where rocky walls or bridges provide nesting locations, and trees or shrubs furnish foraging places. 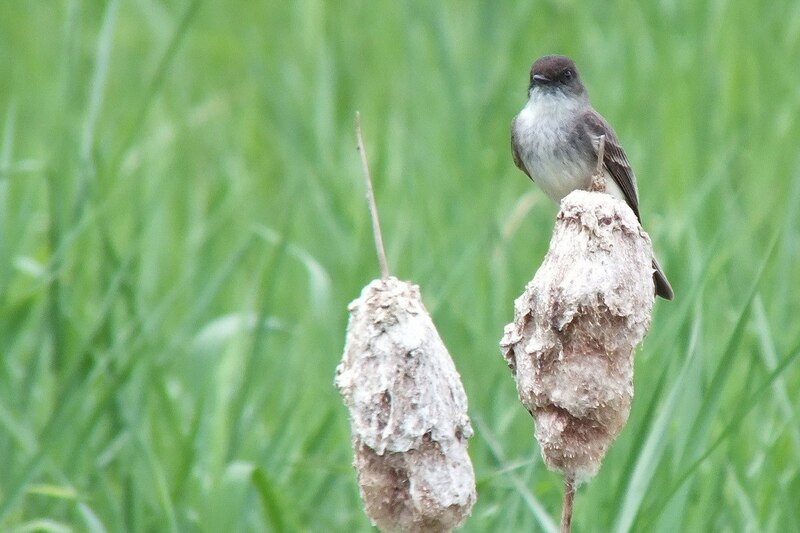 I was happy to see that this phoebe had captured some sort of insect as a reward for its efforts. The barrier on the far side of the dam was a popular spot for the phoebes to pull up and stop. They had a pattern of circulating between the bulrushes, the fence and the small tree below the dam. 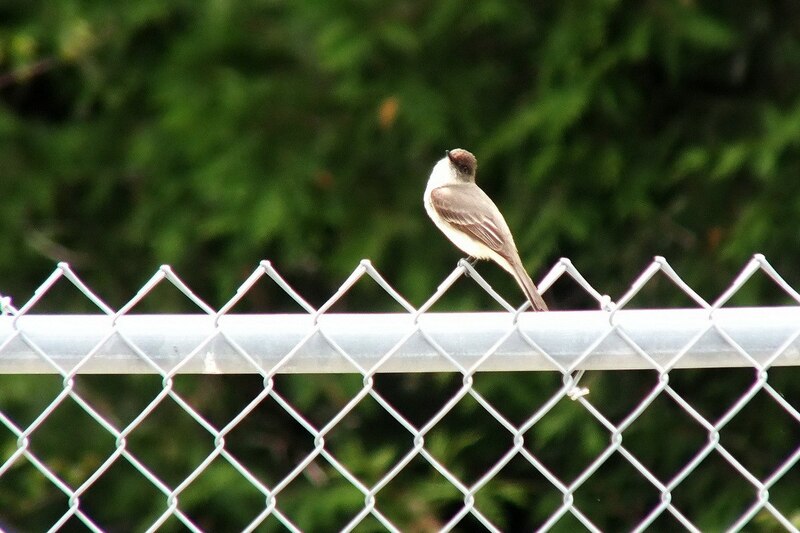 These dull-coloured flycatchers have a habit of frequently pumping their tails up and down when at rest. 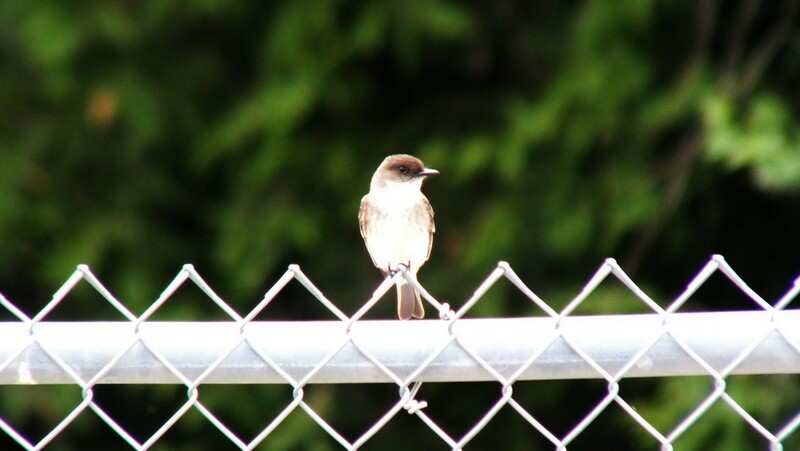 An Eastern Phoebe has a white throat, dirty grey breast and buffish underparts that become whiter during the breeding season. Of note is the bill which is black above and below. Eastern Phoebes are very active birds, and make short flights to capture insects before often returning to the exact same perch. The pair we were watching constantly moved about, as if trying to keep up with the Barn Swallows swooshing about them. Interestingly, Eastern Phoebes will sometimes renovate and use old Barn Swallow nests. Bob and I rejoiced in the calm beauty of the marsh bordering the river, and as always reveled in the marvels of nature. 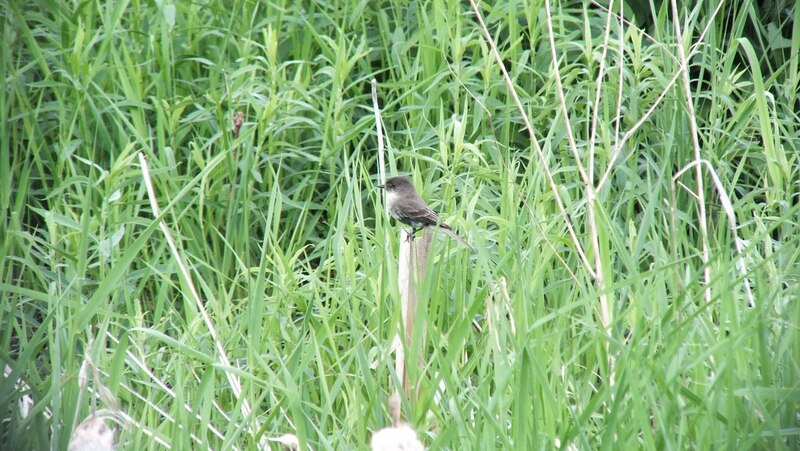 A passing shadow over the rustling bulrushes warned of a hawk soaring on high, and yet it was too distant to worry the phoebes and swallows. The looming sky had Bob and I concerned about a sudden downpour and sent us hustling back along the trail towards Whitevale. 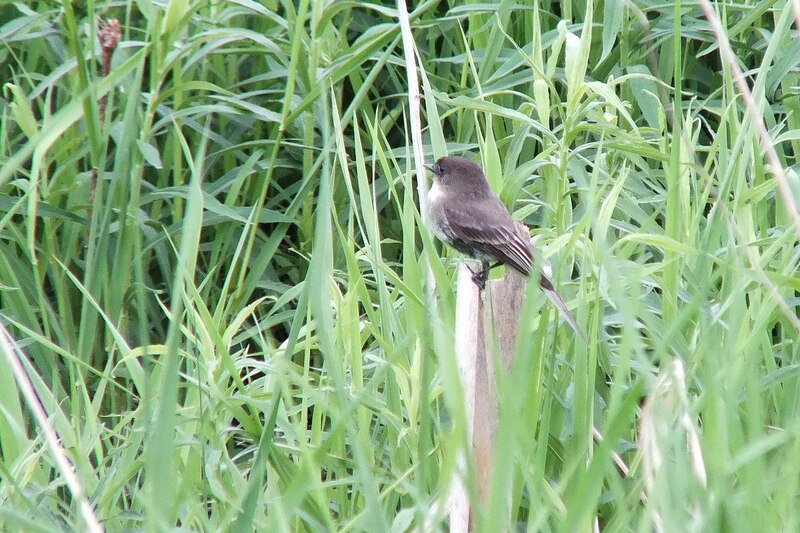 The phoebes paid no notice of the incoming rain and continued their endless circuit of the marsh grasses. Have you been sending these off to Nature Canada? 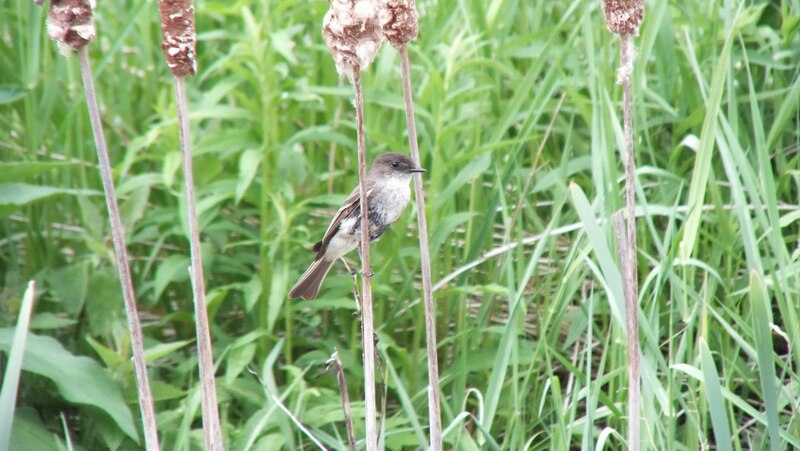 They are collecting data on Canadian bird populations, in particular migrating passerines. 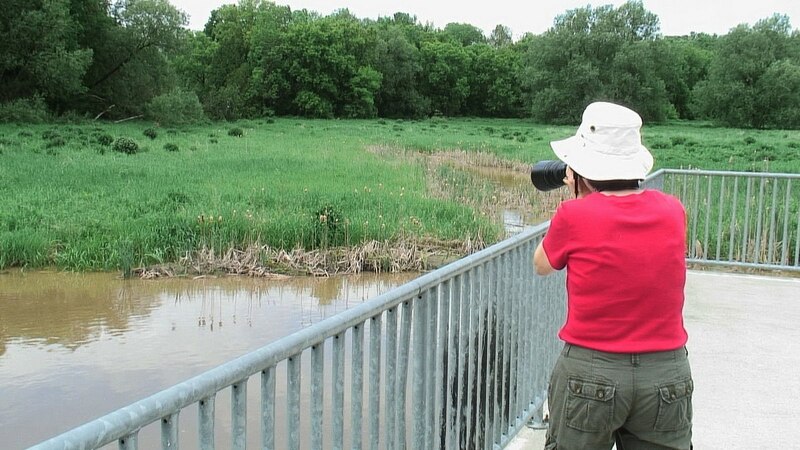 We have been reporting all of our sightings through ebird Ontario and Bird Canada. We will look into giving our information to Nature Canada as well. Thanks for the tip.